Winter is fun! There are many ways to enjoy it such as skiing, ice skating, etc. But it also comes with its load of annoyances. And when not properly equipped to face it, there is nothing less enjoyable and uncomfortable than walking in muddy wet snow, mixed with salt and calcium, in freezing temperatures. The first advice would, of course, be to get good winter clothing. But even a good pair of boots is no match for these arch conditions if they are not pampered. Here are some tips to make this quick and easy! 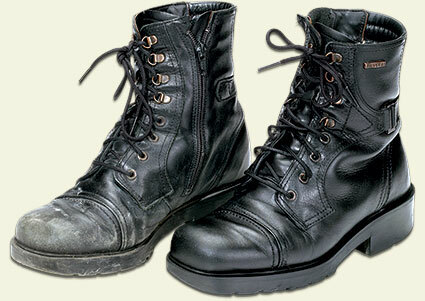 The proper caring of leather boots can be summed up in 3 steps: Cleaning, conditioning and moisturizing, and protecting. • When you return from outside, don’t give the snow, the salt, and the calcium the opportunity to penetrate deep into your boots. Wipe off what you can right away using a dry cloth. • Once they are dry, if dirt remains, spray and wipe AQUILA leather cleaner to remove salt or dirt from their surface. • URAD also cleans off salt and calcium from the surface of the leather. So when doing your weekly conditioning, there is no need to clean them first. • If you notice salt and calcium making swellings on your leather, you can put a wet cloth (with water or with AQUILA) over those areas for a few hours. This will dissolve the salts and make them easier to extract from the leather. After a few hours, remove the cloth and apply URAD. You may notice white salty spots appear as they dry, it may even become very white! This is due to the action of URAD routing out salts to the surface. When it’s dry, gently wipe off the salts with a damp cloth. Repeat if needed. • Moisturizing leather winter boots is essential as the natural oils present in leather will inevitably dry out. Moisturizing and conditioning should be done every week. The good news is that it literally takes only a few seconds to do a pair of boots with URAD one-application-does-it-all leather cream. It takes care of the cleaning, moisturizing and even offer good basic protection! • Once in a while and when needed, you can use GRASSO to moisturize and waterproof your leather. GRASSO deeply, easily and quickly soaks into the leather, moisturizing and waterproofing not only the surface but throughout the full thickness of the leather. • The marketplace is full of Neat’s-foot oil, beaver oil, seal oil, mink oil, etc. These oils do not easily soak into leather and people resort to doubtful methods like heating up the boots in the oven to get the oils in! They will cloak up leather pores with grease buildups, all without actually moisturizing the leather! They just grease up the surface, attracting more and more dirt and actually contribute to drying up the leather. Dry leather will soak up muddy snow much quicker than healthy well-moisturized leather. So the first step to weatherproof your boots is to moisturize them regularly as above. • Because GRASSO actually soaks in, you do not need to use it often. Once every 2 to 4 weeks is fine for most situations. You can actually condition them alternating between GRASSO and URAD (which contains carnauba wax as well as lanolin). • Both GRASSO and URAD offer more natural and better quality waterproofing than silicon, and while silicon dries up leather, URAD and GRASSO moisturize it. However, if you find yourself doing these steps more than twice a week, you might want to consider a more drastic waterproofing products. SAHARA is an industrial strength, long-lasting waterproofing agent that you spray on. Clean the boots with AQUILA or URAD before applying SAHARA and apply it in thin layers, leaving it to dry between each coat. 2 to 3 thin layers should provide protection for one full year or even more! Waterproof your boots BEFORE you wear them. This looks like the dumbest tip, but people tell us every day "...my boots don’t need anything - they are new...". That’s exactly when they need it... unless they are guaranteed waterproof, in which case everything here applies, except you don’t need to use SAHARA for as long as the guarantee runs -normally 6 months. URAD with color is usually a better choice than neutral for winter boots. Realize that "Gucci lambskin winter boots" are very nice and comfortable for winters... in Miami! Today, we have nice looking heavy duty winter boots from many renowned manufactures. Shop around for what you really need, and then care for them properly, your comfort is worth it. When you store away your winter boots for the summer, apply GRASSO to prevent leather from drying and to keep its natural water-repellent quality. Good healthy and well-winterized winter boots can be a major factor in making winter an enjoyable season. 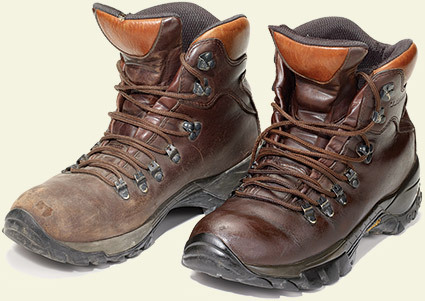 These few tips will go a long way in making your boots last longer and look better! It’s so easy and quick that you’ll have more time available to actually enjoy winter!